Catherine began her golfing career in earnest at Lookout Point Country Club under the tutelage of Gordon McInnis. She began playing amateur in 1973, and became well known as the winner of many Niagara District Championships. During 1977 and 1978, Catherine played outstanding golf capturing the 1977 Ontario Ladies Amateur Championship, 1977 Canadian Ladies Amateur Championship, 1978 Canadian Ladies Amateur Championship, and the 1978 U.S. Ladies Amateur Championship. Catherine's accomplishments were recognized by World Golf Digest, which ranked her the number one Woman's Amateur in 1978. 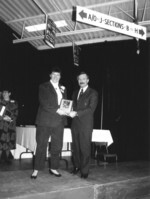 That same year, Catherine was selected as Canadian Lady Athlete of the Year. 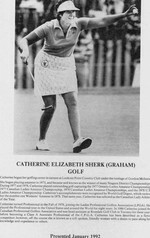 Catherine turned Professional in the Fall of 1978 joining the Ladies Professional Golfers Association (LPGA). She played the Professional tour in the United States and around the World for eight years. In 1986 Catherine joined the Canadian Professional Golfers Association and was head assistant at Rosedale Golf Club in Toronto for three years before becoming a Class A Associate Professional of the C.P.G.A. Catherine has been described as a fierce competitor, however, off the course she is known as a soft spoken, friendly woman with a desire to pass along her knowledge and experience to others.